Cucumbers don’t seem to share the notorious reputation of summer squash for its summertime over abundance however they are productive. They’re also not quite as easy to preserve as something like tomatoes which are easily frozen, canned, or dried for delicious meals later on. If you’ve got baskets of cucumbers piling up on your kitchen counter try a few of these easy suggestions to make the most of your summer bounty. Cucumbers are cool, mild, and refreshing making them an excellent choice for summertime smoothies. If canning isn’t your thing, try checking recipes for “refrigerator pickles.” These can’t be kept at room temperature like their canned counterparts but they will keep in the fridge for a long time. Cucumbers make wonderful additions to homemade fruit sorbets or popsicles. They’re nice and juicy without a lot of intense flavor. Cucumbers are an awesome homegrown way to add excitement to your drinks. Sangria, gin & tonics, or even ice water with your fresh cucumber slices is sure to impress your guests. For those who haven’t heard of it gazpacho is a soup made from blended vegetables that’s served cool. It makes a great summer lunch and there’s tons of recipes to suit everyones’ tastes. Check out this recipe from the BBC, Green Cucumber & Mint Gazpacho. Fermented foods are great for your gut and pretty easy to make. 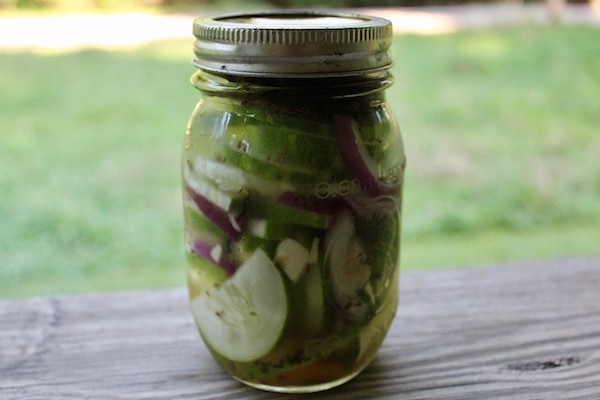 Try this recipe for awesome fermented cucumber pickles. Try a different cucumber salad. Tossing a cucumber slices onto a plain salad can quickly get boring but their are plenty of recipes if you’re willing to branch out try searching for Asian cucumber sesame salad recipes or check Pinterest for more recipes. Add them to a stir fry. It may sound a bit odd if you’re accustomed to only eating fresh cucumbers but cucumbers are delicious in a stir fry or alone. Try frying some with a touch of oil, soy sauce, and ginger. Cucumbers can easily be added to fresh salsa recipes like this one for taco night! 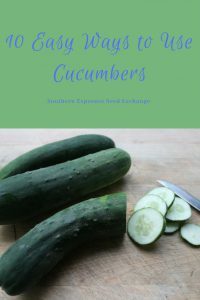 If you’re into crafts or diy projects or have ever tried soap making you may want to try adding some of your cucumbers. Search “cucumber soap” for recipes. As is the case with many vegetables cucumbers are actually very versatile. If you’ve got an abundance this season trying a few new recipes can help you eat more from your garden and spend less time in the grocery store. What’s your favorite way to use cucumbers? Fermenting food is actually one of the oldest and safest methods of food preservation. Despite this fermenting food as a means of food preservation has largely been replaced by canning and freezing. While fermented foods may require a little extra care and attention they are still pretty easy to make and are beneficial to eat. Eating a diet that includes fermented foods promotes healthy gut flora and good digestion. 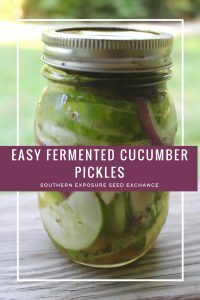 Fermented cucumber pickles are an easy way to get started with fermented foods and they’re just as tasty as home canned ones! They’re also easy to make in small batches, perfect for people with smaller gardens. 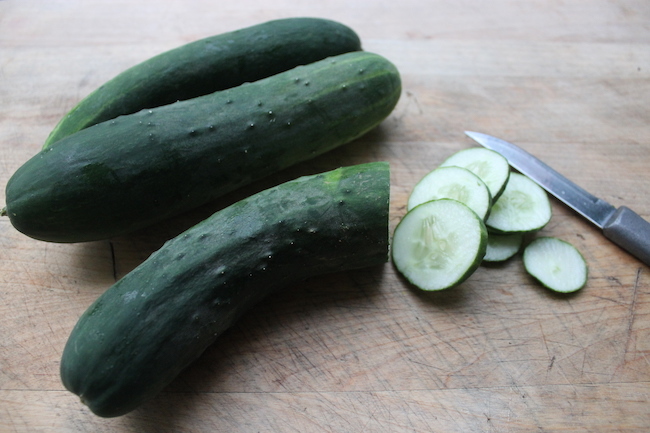 Rinse your cucumbers and remove any that are bruised or damaged. If you’re making a large crock and can fit them in whole they’re ready to go. If not slice your cucumbers however you desire. Spears and slice both work fine. Mix your cucumbers, onion slices, and spices and pack them into your jar or crock leaving an inch or so of head space. Don’t worry that the recipe isn’t specific. It doesn’t matter! Unlike canning you can mess around with ingredients without making your food unsafe. If you’re not sure what spices you’d like small batches are wonderful for trying different combinations. In a quart jar mix 1 1/2 TBS salt and water until the salt is dissolved and pour over your cucumbers. Repeat this process as needed until they’re completely covered. Place some sort of weight over your cucumbers to hold them under the water. You can purchase a crock weight, use a plate, or use a clean rock. In my mini batch pictured above I washed a small rock and used it. If desired you can also layer clean grape leaves over the top of your cucumbers before weighing them down. The grape leaves help keep the air away from your cucumbers and the tannins in them help the cucumbers stay crisp. If you’re using a jar you can now lightly put the lid on. Don’t screw it down tight. If gases can’t escape your jar will explode. If using a crock you can lay a clean towel or cloth over it. Let your pickles ferment for 2-3 days on the counter. Once they’ve fermented they can be moved to cold storage like a refrigerator or root cellar and they’ll last for months! For those of you who don’t know, “quick pickling” is making refrigerator pickles instead of canning them. Refrigerator pickles don’t take as long to make and they’re quite tasty and extra crunchy! Even though they aren’t canned refrigerator pickles can still last for months. Think about how long you’ve left an open jar of pickles in the fridge. The cool temperature combined with vinegar’s acidity is pretty great at keeping the bacteria at bay. 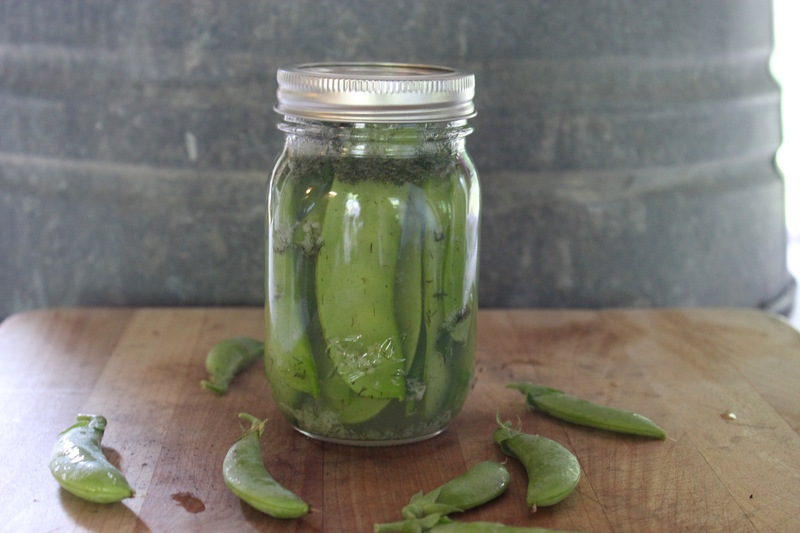 We’ve got a lot of snap peas coming in and while I freeze some I thought pickled snap peas would be a great idea. The savory dilly flavor mixed with the sweetness of the peas is actually pretty perfect. I didn’t want to can them though because I’m afraid they’d lose their crunch. First harvest and wash your snap peas. 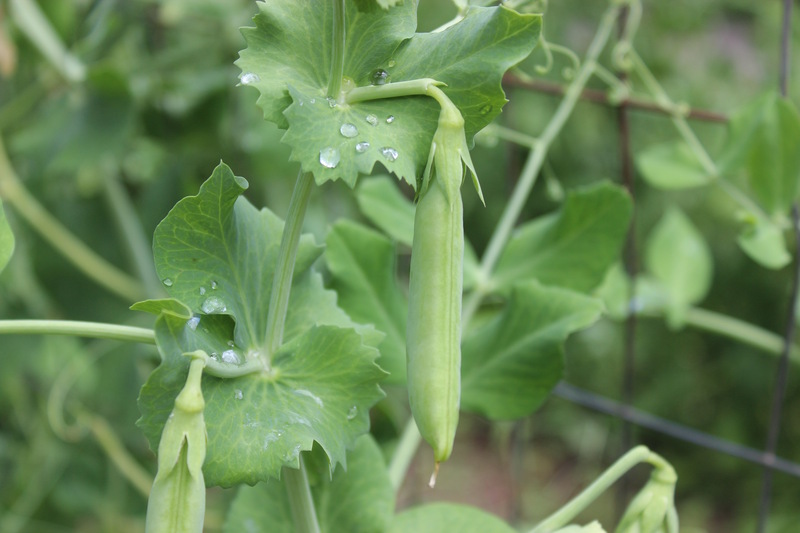 It’s best to use peas that are as fresh as possible and if you’re harvesting to do so in the morning or evening, not under the afternoon sun. In a non-reactive pot heat the vinegar, salt, and sugar until dissolved. Remove from heat and add cold water. Let it sit until it’s about room temperature or cooler (I stuck mine in the freezer for a couple minutes). While it’s cooling pack your jar(s) with the peas and your preferred seasonings. 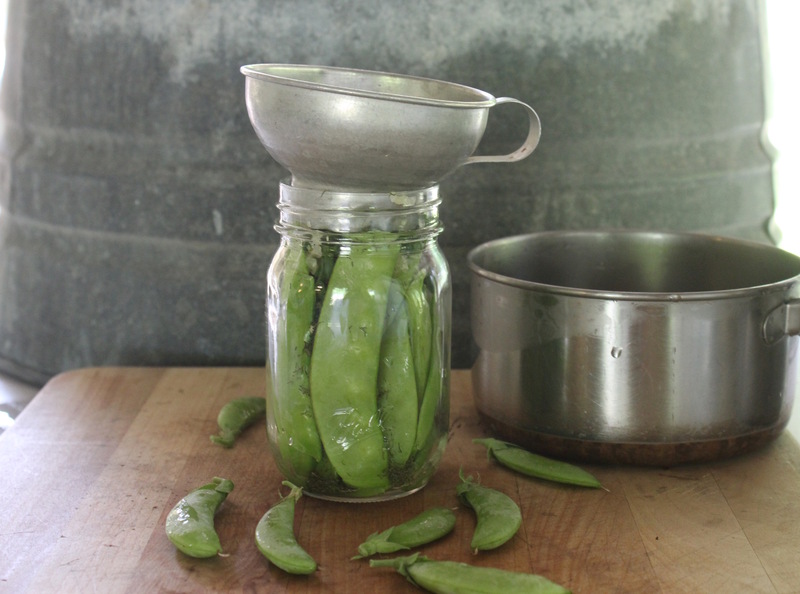 Then pour your mixture into the jar(s) to cover the peas, add a lid, give a good shake and toss in the fridge. Let your pickles sit in the refrigerater to marinate for at least 3 days. This will ensure they soak in all that delicious brine. Non-reactive cookware is made from stainless steel, glass, or enamel coated metal. It’s prefered for pickling because other types of cookware like aluminum or copper might react the acidic vinegar and give your pickles and off flavor. The seasonings for this recipe can safely be played with. You could try adding some spice with a hot pepper or red pepper flakes or go for some bread and butter type pickles. I added some chives to mine. Feel free to play around. If you have extra brine or just want to try something else this works with many vegetables like cucumbers, sliced radishes, or onions.